Friends! 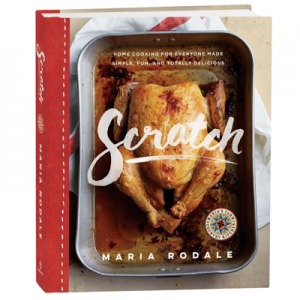 I’m so excited to tell you about my new cookbook, Scratch. You’ll find 200+ fun, foolproof recipes you and your family will love. Check it out! Cheese Omelet Tortilla Cook one egg how you like it, fried, scrambled or flat. One slice of cheese is enough, but you can use more. Put the contents inside a pan-toasted tortilla. Add hot sauce if you can handle it. That should have just taken you less than three minutes…four if you count eating it. Huevos Rancheros. This takes a bit longer, but it’s oh, so worth it and will hold you over for a whole day if you add enough toppings. The works is beans, cheese, fried egg, salsa, guacamole, sour cream—did I forget anything? Check out my full recipe. Quesadilla with Cheese. On to lunch (or a light dinner)… I often use two tortillas, add cheese in the middle, toast each side with oil in my cast-iron pan, and then cut the results (with a scissors or a pizza cutter) into wedges for everyone to eat. They’re easier to handle than one big one. Quesadilla with Cheese and Red Peppers. To add some veggies, cut up sweet red pepper in tiny little cubes and add them to the inside as it’s cooking. Kids will eat it and not even complain about the vegetables. Well, my kids will. In fact, they ask for it. Chicken Quesadilla. This could work for lunch or dinner, but it works fastest if you have leftover cooked chicken. If you don’t, quicken the cooking time by chopping the chicken into small pieces and cook it with some oil, cumin, chili powder, and salt. Then put it inside two tortillas with cheese. Toast the quesadilla in the cast-iron pan. Add all the fixings. Raw onion is good with this, too—or better yet, my homemade fresh salsa. Soft Tacos. Continuing on the Mexican theme (tortillas are Mexican, after all! )… Heat the tacos in the pan (add oil if you want that fried taco taste). Then add all the fixings. There’s nothing like some ground beef, cheese, lettuce, tomato, and onion with salsa to satisfy a taco craving. I cook up my ground beef with a bit of cumin, chili pepper, and salt. Pizza. It’s not as good as the real thing, of course, but in a pinch, tortillas make fine pizza crusts. Again, cook them up first so they are a bit crusty. Then add your toppings and broil. Thinner toppings work better. Chips for Dip. Melt some butter and fresh crushed garlic in a pan, spread the mix over the tortillas, add a bit of Parmesan or Romano cheese, and bake or broil for a quick, healthy, and fresh-tasting party chip. Cut them up into slices before or after, depending on your preference. Cinnamon-Sugar Tortilla. 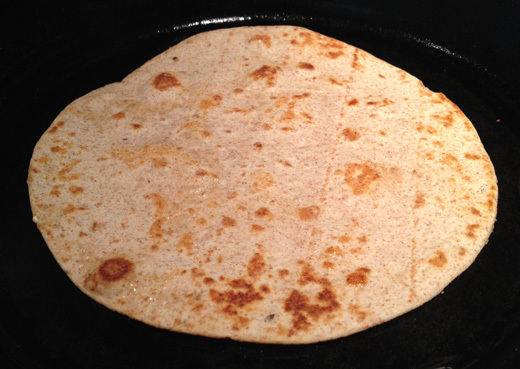 Fry up a tortilla in a pan (or use melted butter! ), sprinkle cinnamon-sugar on top along with melted butter. Simple and so, so good. Quick Tortilla Pie. Again, fry up a tortilla in a pan. Sprinkle sugar on it while it’s cooking so the sugar melts. Add some already-cooked fruit (like rhubarb and strawberries, sour cherries, or apples), top with whipped cream or a scoop of ice cream, and there you have it! I love this! I could eat a tortilla with nearly every meal. I especially enjoying different forms of quesadillas. Maybe your list will keep my poor husband from getting TOO bored when I’m in a tortilla rut:-). Have you got a good, healthy tortilla (shell) recipe? That’s what I’m looking for! I’m having a good salad right now, & made the (dipping) chips to go with it. I think most college students and bachelor(ette)s would be much happier if they put tortilla pizzas into rotation. Great list! Roll into about 8-10 balls. Get out your rolling pin and roll flat. Brown on each side in hot skillet. That’s it! Enjoy! Hopefully the corn to make Tortillas has been nixtamalized first, as it was done in early Mexico of 2000 years ago, and not the way it is done in the US and Africa today. If not, than malnutrition and pellagra maybe in your forcast, due to a lacking of vitamin B3, or niacin. The same goes for wheat that has not been nixtamalized. 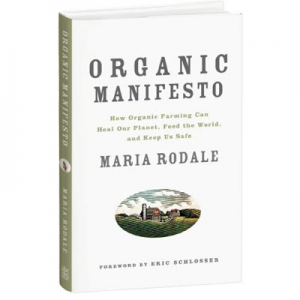 The wheat of Cleopatra’s day (and the flour process) is certainly not the cross pollinated wheat of 200 years ago, and certainly not the wheat of today that was developed (genetically modified, not GMO) in a petri dish in the 1980’s.